If you reside in Pennsylvania and are an aspiring HVAC technician, there is good news! The state is a great option for this profession and also caters individuals interested in this line of work with various accredited schools. In addition, the state has abundant job options. One of the biggest reasons why this field has become so promising in this region is that the standards for energy efficiency are continuously evolving. The overall HVAC technologies is changing quite rapidly. Today, service from these technicians are not only requested by commercial system but also by residential systems who need regular maintenance. You must understand that technological advancements are making equipment smarter, and so there is an increasing demand for individuals to keep up with the latest in business. Here, HVAC workers are supported by different professional networking organizations and also trade associations. An example of this would be the Air Conditioners Contractors of Western Pennsylvania, which protects the interests of industry players and works jointly with groups like EPA to enhance energy efficiency in systems. The organizations core value is “quality, honesty, integrity and good faith.” It also strives to promote business growth in a very safe and ethical manner. Basically, some of the common air conditioning repair services include refrigerant replacement and system tune ups. HVAC techs have to work with high velocity units, heat pumps, multi-zone cooling systems, thermostats & air cleaners, whole house filter systems, central air units, humidification and dehumidification. Before starting your career, read about these and discover the occupational outlook in this industry. Also learn about the HVAC salary prospects. Find out about your certification options and learn about the abundance of accredited programs in Pennsylvania. As already established, there is a range of options for anyone who is looking to enroll in a HVAC program. Think and compare wisely before enrolling into any of these. It is recommended to contact some of the schools personally and discuss with individuals in charge of the programs focusing on HVAC. The internet will provide some good information but oftentimes, details provided online are not updated. If you are interested to learn the basics of the HVAC field, you can select one of the many educational programs available in Pennsylvania. Some of the options are certificates, associate’s degree and a bachelor’s programs. Partnership for Air-Conditioning, Heating, Refrigeration Accreditation, also known as PAHRA, is the prime accreditation agency for these programs. There are also courses which focus on training students about fundamentals of furnace technology, air conditioners and commercial refrigeration. 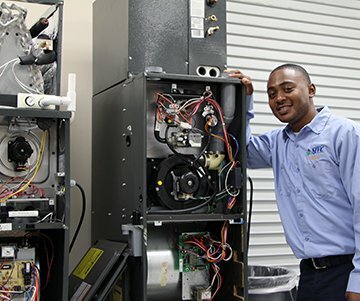 The curriculum usually entails a combination of computer based exercises and hands-on instruction with a qualified HVAC professional. You will be learning about latest heating systems and controls, service and procedures, applications of refrigeration and temperature controls, and many other bases of this career. Students can get their certificate of accomplishment and use it to get good jobs. While searching, look for courses and certification that are accredited by PAHRA or other reputed organizations. There are many specialized schools around the state which provide preparation classes for the 608 certificate. The Environmental Protection Agency has a list of all the approved Section 608 certification programs as well. The North American Technician Excellence has a range of certifications for aspiring HVAC workers. They have to pass a core examination and a specialty exam in order to qualify. RSES also has 8 additional specialties. This includes commercial air conditioning, domestic service and heating. Another mentionable certification is heating, electrical, and air conditioning technology (HEAT). For most these, you are expected to submit an application, pay a fee, show proof of work experience, and then pass exams (hands-on and written part). Duration will vary depending on the course and institute you select. You may have to do a didactic coursework. In addition, you have to a capstone project. Another option is a supervised internship which will help you apply your newfound knowledge of fabrication, soldering, brazing and other topics to use. A bachelor’s of technology degree is a program which can enhance your career opportunities. It is, sometimes, an extension of the associate of applied science degree. A bachelor’s degree will give students a good understanding of how they can help maintain comfortable indoor climates. They will also have to think about efficiency and energy conservation. This degree is especially appealing to the aspiring HVAC professionals who have interest in management roles. If you are looking to get increased responsibilities in the future, this degree is your ideal step in the right direction. Some of these degrees are followed by externships opportunities with local employers. This will prepare you will practical knowledge for career. There are many US states which require HVAC techs to have a license before they can start practicing. There are, however, some exceptions. Some of the states do not want a license and in this case, the technician might not need to be licensed at the municipal or local level. These policies can change over time. You should check with state regulating authority to find out latest regulations. The Pennsylvania Department of Labor & Industry states that HVAC contractors are not required to have state licensure to operate as HVAC technicians in the region. However, regulations can differ from one city to another. The Pittsburgh Bureau of Building Inspection, for example, provides a HVAC licensure examination. The authority requires any HVAC contractors within Pittsburgh to be certified. In order to qualify for the licensure exam, candidates must conform some requirements. They must have proficiency in English language, be 18 years of age or older, and have minimum 4 years of work experience. They will also have to submit the licensing fee, Proof of Contractor’s General Liability Insurance, Proof of registration for city taxes and the International Code Council certification. Check with the local bureaus and verify exactly what licenses are needed for HVAC contractors. Even though any professional certifications are not mandatory for employment in Pennsylvania, having a certification can help convince potential employers that as a candidate possesses you possess certain skills. In fact, many HVAC employers actually look for credentialed professionals. According to data from the Bureau of Labor Statistics, HVAC technicians, mechanics and installers get a very good wage. The figure is impressive especially because this is a profession with requires just 6 months to 2 years of post-secondary education. There are around 274,680 HVAC workers all over United States. Their mean yearly salary is around $47,380. The figure varies hugely based on expertise of the person and years of prior work experience. The average figure suggests that 50% of the worker earns less than that and 50% earns more. The 10th percentile makes $27,790 with minimum education and experience. On the other hand, those who have been in the industry and experienced positive career advancement can earn much more than the average projected earlier. The 90th percentile makes $71,690 per year. In term of wage, the average US wage for HVAC mechanics is $21.96 per hour. Again, there are people who earn less than that and those who earn much more. The lowest wage is around $13.36/hour in this industry while the highest is $34.47. According to Pennsylvania specific data, professionals in the state earn $39,000 as average yearly income. The average salary for HVAC techs in Pennsylvania is about 4% lower than the average salaries for the same job postings nationwide. In fact, the salary can vary based on which city you reside in. A major deciding factor is living cost. Other key determinants are level of education and years of work experience. As you continue to work, you get the chance to learn. This leads to increase in salary. It is recommended to work with the same employer for a period as it enhances the learning curve. Many technicians can exceed the salary range provided here as they work overtime at the start of cooling and heating seasons. They sometimes even set up their own companies upon gathering enough knowledge, capital and expertise. To be precise, 16% HVAC techs end up owning their own businesses. It is to be noted that there is a national shortage of HVAC technicians and designers. This is reflected in the job opportunity in Pennsylvania as well. There are many different options available. Graduates just need to seek out and seize their opportunities. It is expected that employment of heating, air conditioning, and refrigeration specialists and installers will grow 14% by the year 2025. This a much faster rate than the mean for all occupations. As an HVAC Service Technician, your tasks will be to diagnose and then troubleshoot problems with your HVAC equipment. You will repair and replace defective equipment, parts and wiring on HVAC equipment. The job entails carrying out certain preventative maintenance tasks and inspection of HVAC equipment. If you think you have the required skills to be in this industry, you should start applying for jobs. This is a sector where entry is quite easy. In Pennsylvania, you do not have to worry about any strict education, training or licensure requirements. Even though having some relevant certifications can ensure employment and a higher salary, you can work without them as well. This trade school offers a lot of different training options for those who live in the Pittsburgh area including those looking to enter into the HVAC industry. The school not only teaches you HVAC but the program at All State Career will prepare you to take the Environmental Protection Agency’s Refrigerant Transition and Recovery Certification test. This is a must for anyone serious about going to HVAC. The HVAC is offered at 50 West Powhattan Avenue Essington, PA 19029. Do you live in the Pottsville, Pine Grove Bloomsburg or Frackville area and looking for a quality HVAC training program? Look no further than McCann. You can graduate in their hands-on HVAC/R program in as little as 18 months. They will even help you with your career planning by offer lifetime career assistance to their students and graduates. Their externship program will get you placed into a real-life work environment and give you the hands-on experience you need to succeed. In Pennsylvania they have campus locations in: Alentown, Carlisle, Dickson City, Hazleton, Pottsville, Lewisburg and Wilkes-Barre. If you need to enter the workforce quickly with a certificate in Heating, Refrigeration & Air Conditioning Technology then look in to YTI Career Institute. You can complete their program in as little as 12 months. Their program is 51 credits. The program is offered at 1405 Williams Road York Pennsylvania 17402. If you are new to HVAC and want to just learn the basics and get an introduction to the training then consider a 30 hour introduction HVAC course. Contact the school directly at 688 Western Avenue Canonsburg, PA 15317. When it comes time to get a job as an HVAC technician one thing you’ll want to pay close attention to is how specialized even the HVAC field is. Some of the requirements needed to make the higher end salaries you’ll find require 5 to even 10 years of experience but also a long list of responsibilities. I’m not writing this to scare anyone from not entering this career but the intention is to let you aware of all the things you need to be successful. I would make sure that your training covers these areas but also be prepared to learn many of things employers are looking for while on the job. -	Be familiar with force air gas furnaces and gas fired boilers. -	Understand and be able to explain HVAC codes and best practices. -	Attend seminars to further your knowledge of HVAC. -	Earn your EPA Universal Certification. This includes Type 1 and Type 2 Certification. -	Recalibrating JCI controls and understand air compressor and dryer repairs. -	Experience working with governance agencies including: DOT, OSHA, DCMA and ANSI. This is highly important if your goals are to have a HVAC management career once you have worked in the industry. As mentioned pay usually depends on the number of years you have been working as an HVAC technician and the knowledge you have gained over the years. We found both entry level openings as well as $100K a year positions with signing bonuses in: Huntingdon Valley, York, Harrisburg, Lancaster, Ridley Park, Philadelphia, Conshohocken, Audubon, Chester County and Allentown to just name a few.